People now realize that indoor air quality is important to the health of their families, and there are a number of great products designed to improve the quality of the air you breathe in your own home. 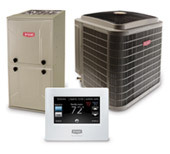 Boyle Heating & Cooling is your expert installer of the full range of indoor air quality products, including; humidifiers and ventilators, air filters and other products designed to keep your home free of unhealthy pollutants like; pet dander, dust, pollen and mold and other bacteria. Give your family peace of mind and breathe easier with the right indoor air quality products from trusted brands like Bryant or Payne. Contact Boyle Heating & Cooling to set up an evaluation and assessment of your home!